Registration is now open and slots are limited! Attention! Please read the application as changes were made this year with regard to location, registration deadline, prizes and awards, and setup. Entries are limited to 40 cookers. Please have a Fire Extinguisher on site. 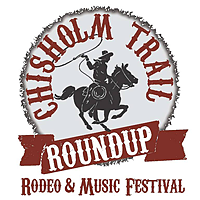 This event is co-hosted by the Lockhart Chamber of Commerce & Chisholm Trail Roundup with all rules for judging written by these organizations and the Lonestar Barbecue Society. Contestants may begin to set up Wednesday, June 12th at 5:00 pm. Contestants WILL NOT be allowed to set up prior to this date and/or time. If the entry fee has not been paid in full, the contestant(s) will not be allowed to set up and/or given a designated space. The cook-off will take place in the enclosed softball field located across from the Rodeo Contestant Parking Area. NO PARKING WILL BE ALLOWED ON THE INFIELD. Contestants can only setup on the grass area of the softball field. A team will consist of a Chief Cook and a maximum of three (3) assistants. The Chief Cook will be held responsible for the conduct of the team. Excessive use of alcoholic beverages will be grounds for disqualification, with no refund of entry fee(s). ALL PERSONAL ALCOHOL MUST STAY IN THE DESIGNATED BARBECUE COOK-OFF AREA. UNDER AGE DRINKING WILL NOT BE TOLERATED AND TEAMS WILL BE ASKED TO LEAVE IMMEDIATELY. Quiet time is from 1:00am to 8:00am. Only moderate amplification during the daytime hours will be allowed. Contestants MUST sign in before the Cook's Meeting Saturday, June 15, 2019 at 10:00 am. A mandatory Cook's Meeting will be held on Saturday, June 15, 2019 at 10:00 am under the judging tent located on the barbecue layout map provided. Any category entered must be cooked on site, as defined in the Lonestar Barbecue Society By-laws without pre-cooking or marinating. Random inspections may be performed to assure that meat is not prepared prior to the official start of the competition. There will be a limited number of available spots to reserve this year. Cooking spots 1-24 and 26-40 are 40' x 20' in size. Cooking spots 22-25 are 50' x 30' in size. The four larger cooking spots can be purchased for an additional $25.00 fee separate from entry fee. If it does not fit, contestants will not be allowed to park in the the cook-off area. Each team will only be allowed one vehicle in their designated spot as long as it does not exceed spot size. All other vehicles will be parked in a designated parking lot next to the barbecue area. Each team will be allowed only two (2) free park entries and two (2) Barbecue Parking Permits. All others will be required to pay upon entry into the park. No golf carts or any other wheeled transportation, other than medically necessary, will be allowed in the park. TOWING WILL BE ENFORCED AT THE OWNER'S EXPENSE. All RV's and campers will be parked long-ways in the designated cooking spot. NO EXCEPTIONS. Cooks are to prepare and cook in as sanitary manner as possible. Cooking conditions are subject to inspection by the judging committee. Infractions identified by the judging committee shall be immediately corrected or the cook will be subject to disqualification. During and after the event each team is required to keep the area clean of all trash. 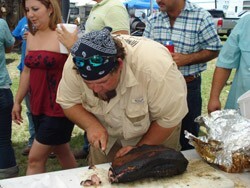 Lonestar Barbecue Society recognizes only one entry (one Chief cook) will cook on a given pit. It will be the responsibility of the promoter's to monitor entries. Notwithstanding, multiple entries in the same category by the same cook and multiple entries from the same piece of meat shall not be allowed. The promoter may specify the types of BBQ pits, as defined in the By-laws of the Lonestar Barbecue Society, allowed during any sanctioned cook-off. Non-specification will authorize any type of cookers. Any commercial or homemade, trailered or untrailered, pit or smoker normally used for competitive barbeque. A BBQ pit may include gas or electricity for starting the combustion of wood or wood products but not to complete cooking. Any cooking device by design or nature that is inherently portable and designed is intended for recreational cooking. NO OPEN/GROUND FIRES ARE PERMITTED!!! © Copyright 2014, Chisholm Trail Roundup. All Rights Reserved.